Okay, so vacation officially started today, but I am teaching a week's worth of college for kids at our local university. I am teaching a STEM coarse in Roller Coaster Science. I have a great group of 8 kids each session. Today, we worked on building up our vocabulary, working as a team to build paper plate roller coasters, and earning money using our new words, finishing our recording sheets, and working as a team. That "money" will be used to purchase items at our store. Lots of great math to tie into the science of roller coasters. 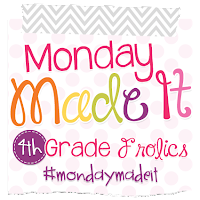 Thanks to Tara, at 4th Grade Frolics for this week's fun Monday Made It! Paper plates, blocks, tape, scissors, a cup, and a marble! This group used their paper to create a tunnel...great engineering! Gotta love how they used bumpers to create friction! My son was in a baseball tournament all weekend after a looooonnnggggg week of school, so I didn't get to make any products which was my goal. Next week maybe, but for Made it #2...my son made his very first tournament win! What a great Father's Day Gift. He made it happen! His team did a great job working together! My little buddy is the one in the red cap...back row! This Monday made it was our one little painting project this last week. It isn't much, but we really wanted to tackle a little something each week. This next week, though the dresser! Before...an ugly gold vase ready to paint outside. The finished product...blue to match my daughter's new apartment bedroom...with a touch of peacock feathers! Next week's Monday Made It goal...a new product, inspiration from an Energy Class, and a finished dresser!